You wanna sit in that sun? Be my guest. There were certainly other options this week, a few other games equally worthy of this space. But I was at Pizza Hut Park on Sunday night to take this one in, so it gets the nod this week. That's my fine work over there. A good game played in ungodly conditions. Texas is a hot place. A Texas July in 2011 is heat beyond all reckoning. There has been less than five inches of cumulative rainfall in certain parts of the state over the last six months. In the Dallas-Fort Worth metroplex, where this game was played, there have been nearly five consecutive weeks of 100+ temperatures. That's 35 straight days. Even for heat-adjusted Texas folk, that's nothing to ignore. MLSS insists this game was played in 102-degree heat. Our car on the ride in boldly displayed 109 in the parking lot, and it felt every bit of it, even in the shade where we were parked. I assumed the game would take on some of the weather's gluggy characteristics, and I wasn't wrong. Only it took until FCD's opening goal to get there. I was pleasantly surprised by the verve the Hoops displayed rolling forward in the opening 30 minutes. This was the first chance I've been able to see them in person this year, and their reputation as an attractive attacking side is well deserved. Schellas Hyndman's coaching hijinks have been well-documented, and you saw on Sunday night why FCD has been so effective even without talismanic MVP David Ferreira. Hyndman rolled out what comfortably settled into a 4-2-3-1 with Bobby Warshaw and Bruno Guarda settling deep in midfield, Marvin Chavez and Brek Shea on the wings, youngster Ruben Luna up top and Ricardo Villar vacillating between roles as Luna's strike partner and the central attacking midfielder. The combination produced some genuine moments, especially with Chavez and Shea ripping down the sidelines while Luna missed chance after chance up front. But it was on prolonged forays toward goal that Hyndeman's tactical know-how really came to the fore. Zach Loyd, George John and Ugo Ihemelu slid into a three-man back line while left back Jair Benitez slotted in as another attacker behind Shea on the left. This allowed Shea, consistently the most dangerous force on the field, to float in free crosses and roam inward while defenses respected the speed and crossing ability of Benitez. It was this space that allowed Shea to shuttle in the cross that led to Chavez's goal in the 26th minute. Even when Chivas pressed forward, they were rarely allotted the space and time to make many dangerous inroads. Bobby Warshaw's third career start in place of resting holding mid Daniel Hernandez was a train wreck, but that aside, the back four was incredibly well organized and notched another nearly perfect day. FCD has eight shutouts in its last nine games and Kevin Hartman put up his 12th of the season, a league high. John is an imposing presence in the middle (he's taller than Shea and decidedly thicker) and Ihemelu is agile and has handles. If there's a defense playing more cohesively right now, I haven't found them. The most remarkable thing here was the travel burden incurred by FCD and the complete lack of effect. 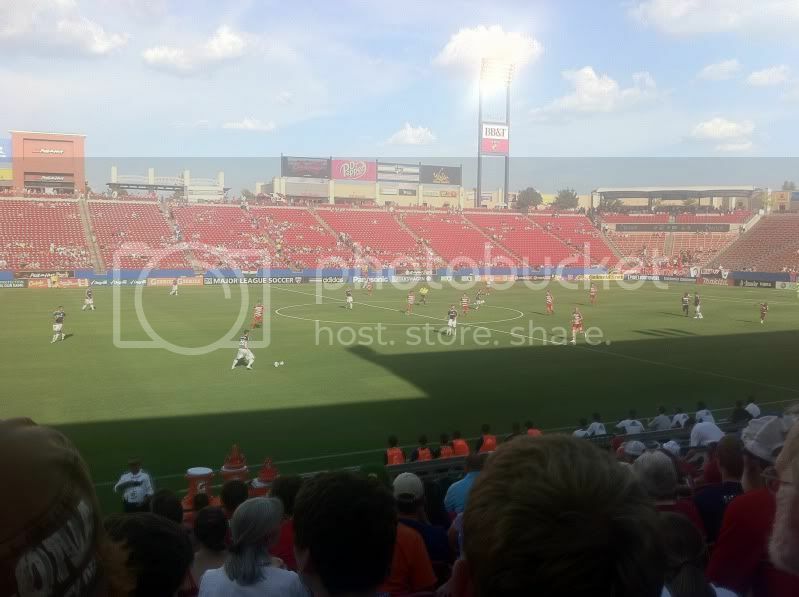 FCD logged an incredible 4,000 miles in three countries over the last 11 days between MLS and CONCACAF duties, and they were 3-0-1, which includes a win in the largest stadium in Central America and a win on the hottest day ever recorded at Pizza Hut Park. If this didn't break them, I'm not sure what will. - Is anybody paying attention to those fellas in Columbus? The ones that just smacked RSL 2-0 in the now-totally-not-impenetrable-fortress Rio Tinto? The ones who now own sole possession of first place in the East? The Crew fans lamenting an uneven start are now cheering on the team with arguably the fewest questions in the East over the last month. Where you at, New York? Eddie Gaven and Tommy Heinemann scored five minutes apart to put the Crew above the rest in an Eastern Conference that nobody seems able to lead for long (I'll eat this computer if a team from the West doesn't win the cup this year). I'd like to see Columbus consistently beat the league's top teams before I'm fully on the MLS Cup bandwagon - their two wins before RSL were Vancouver and Portland - but this is an encouraging sign for those Tressell-ites without a Tressell. - I said last week that DeRo's presence (No. 5) and subsequent rise in my top five 2011 signings list was contingent upon his ability to expand upon his impressive start in DC. Welp. How's a brace in 2-0 road win over San Jose do ya? - Teal Bunbury has been awful quiet since dynamiting his way into the national consciousness with the Nats last winter with running partner and light-hearted Twitter foe Juan Agudelo. He reacquaints us all (on his bobblehead night) by dramatically saving a point against 10-man New England in a 1-1 draw. - Brian Ching is back. - I'm unsure of whether this really belongs here, but I suppose there are a few coaches who might agree while they look over their shoulders at Bob Bradley over there in the corner, eerily wringing his hands at the possibility of an easy MLS gig. MLS front offices being what they are, the spotlight now turns to Bradley's intentions. If he has his heart set on Europe, there is little to be done but wait until he either lands somewhere or fails and slinks back to MLS. It behooves the league (and the sport in this country) that Bradley succeeds abroad. While US players have done yeoman's work over the last decade in removing unhealthy stereotypes about its players, US coaches have not yet broached this topic. I remain skeptical about many of Bradley's theories, but perhaps his sudden, unexpected sacking forces him to rethink some of his staid policies and adapt. Who knows. But I do know that Tommy Soehn, Aron Winter and Frank Klopas - two of whom are caretakers - are hoping Bradley succeeds abroad too. - This is just a gripe of mine, but I remain unimpressed and a little surprised at the lack of development from TV commentary from Americans, namely the many that invade our homes for MLS games. I get that ESPN reached out to Adrian Healy and Ian Darke (who is fantastic) for their lead commentary slots not merely because they were Brits but because they are incisive and intelligent. They also deserve those positions. But unless you're a JP Dellacamera fan (which ESPN apparently isn't), the landscape is surprisingly barren for substantive American alternatives. A lot of this is subjective, but I can do without John Harkes, Brian Dunseth and Taylor Twellman. It tends to thin out further in the market specific broadcasts as well (Quakes and Revs fans are particularly afflicted). Hopefully we'll see this arena continue to grow along with the league. We need it. Also, 100+ for 35 days is just absurd. I keep waiting for teams to come after him, but nothing so far. I do know a couple of English clubs have been monitoring him for a long while, but no serious approaches yet. His size, speed and upside should be an instant attraction for buyers. He wins nearly every header, has a wicked cross and a natural predatory instinct toward goal. He was a bit mercurial in his youth, which stunted his growth, but I think he's matured beyond that now. Hyndman has a loose leash with Shea (he floats all the way to the right flank at times), but its obvious he's most comfortable out wide on the left. That said, when FCD failed to find a worthy striker on Sunday, Hyndman moved Shea up top for the last 10 minutes and he was just as dangerous. Of course that robs you of some of his skill set, but he plays a lot pinching inward anyway. I get the sense that Hyndman just wants him in front of goal.